​Learn from some of the original writers, organizers, designers, educators and researchers in the field of Restorative Justice. 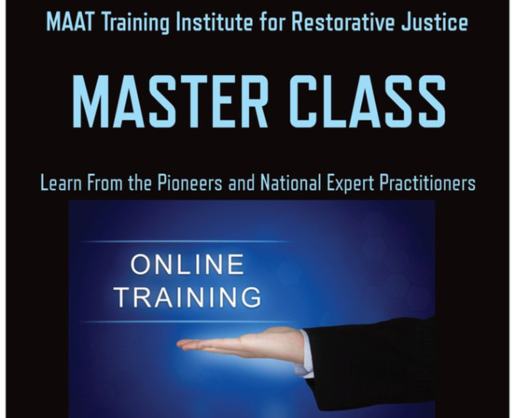 The MAAT Training Institute for Restorative Justice is sensitive to the growing trend of Restorative Practices, and limited access to quality training. It is our intention to provide easy access to experts in the field whenever and wherever it is convenient for you online. Congratulations on taking this next step to invest in you, and your Restorative MIND journey! You will receive a personal phone call from Dr. Ivy Hylton, LICSW, Ph.D., CEO/President of Youth and Families in Crisis, LLC, to discuss your career and professional development vision and plan. The MASTER CLASS is designed for each member to join the "Circle of RJ Practitioners" and offers members opportunities for joining the MAAT consulting and training team. This level of membership offers monthly group RJ coaching conference call, and 6 week on-line training program with weekly assignments. The on-line training program offers a video introduction of each area of expertise, (featuring the MAAT Expert and Pioneer), access to Master Class FaceBook Page, and self pace educational curriculum. Access to RJ Master Class Members Level I requires a pin number, assignment goggle drive link access, and access code. All assignments will be posted on a google drive. This level of membership offers monthly group conference call, 90-minute One-on-One Coaching session with MAAT Instructor of your choice, and 6 week on-line training program with assignments. Access to Master Class FaceBook Page, and self pace educational curriculum. Access to RJ Master Class Members Level II requires a pin number, assignment goggle drive link access, and access code. All assignments will be posted on a google drive. (If a student expresses interest in continuing one-on-one coaching with each expert, it is up to the expert to establish rates of service and level of care for each member. This level of membership offers monthly group conference call, four (4) 90-minute One-on-One Coaching sessions with MAAT Instructor of your choice, and 12 week on-line training program with assignments. This is an extraordinary value for Manifest Members to take advantage of. Access to Master Class FaceBook Page, and self pace educational curriculum that covers every expert area practice. Access to RJ Master Class Members Level III requires a pin number, assignment goggle drive link access, and access code. All assignments will be posted on a google drive. Describe restorative justice competency development. BARJ 104: Juvenile Offenders from the Restorative Lens - Who are They? Build skills and connections based upon that changing role. Determine the stage of a relationship of a community partnership. Describe a variety of ways to meet needs of victims. Explain how internal personal work supports external change. Discuss strengths of the court and community cultures that contribute to building a bridge between the community and court through restorative justice. • Build skills and connections based upon that changing role. BARJ-E 105: Juvenile Offenders, who are they in schools?